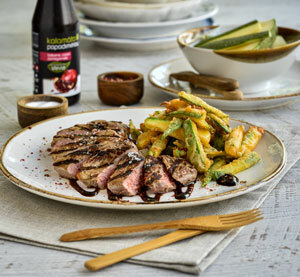 Place the sirloin steaks in a bowl together with the pomegranate balsamic cream with stevia* Kalamata Papadimitriou, the 4 tbsp olive oil, salt and freshly ground pepper. Mix well and leave them in the refrigerator to marinate for 20-25 minutes. Using a sharp knife on a cutting board, cut the courgettes in julienne. In a deep bowl, mix the flour with the two tbsp. olive oil. Add the sweet paprika and the lager and mix well with a whisk until you have a smooth batter. Pour a generous quantity of sunflower oil in a large deep frying pan; place it over high heat and heat well. Dust the julienne courgettes with a little flour and shake them very well. Immerse the courgette sticks in the batter, remove, shake them slightly to remove the excess batter and fry them in the sunflower oil for 1-2 minutes. Remove the courgette sticks from the pan when ready and place them on a plate lined with kitchen roll to absorb the excess sunflower oil. Place a non-stick grill pan over high heat to heat well and cook the sirloin beef on both sides for 4-5 minutes in total. When the sirloin steaks are ready, remove them from the pan, place them on a cutting board, let them rest for 5 minutes, and then cut them with a sharp knife into thin, diagonal fillets. Serve the courgette sticks together with the sirloin fillets, drizzled with pomegranate balsamic cream with stevia* Kalamata Papadimitriou.